For the first time ever, the U.S. women’s soccer team has failed to make the semifinals of a major tournament. The Americans lost 2-1 in penalty kicks to Sweden on Friday in the quarterfinals of the Olympics. The loss was a historic one and shocked many following the U.S.’s World Cup victory in 2015. It also continues the streak of Women’s World Cup winners not winning the gold medal in the following year. After trailing 1-0 for most of the game, Alex Morgan got the U.S. on the board with a goal that came thanks to the ball going off of the face of a Swedish defender. Following a scoreless extra time, teams went to PKs. 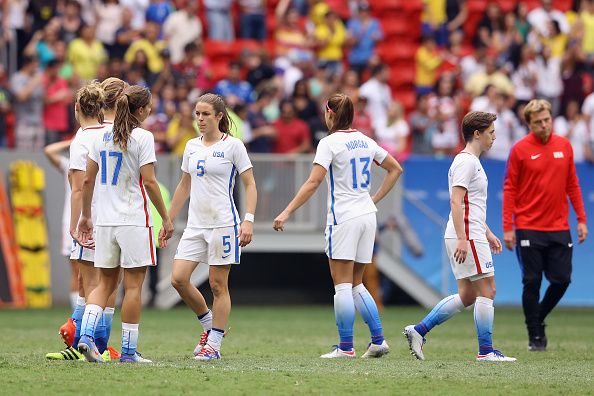 The U.S. ended up losing 4-3 and had costly misses from Morgan and Christen Press. After the match, U.S. goalie Hope Solo expressed quite a bit of anger to the media. She criticized the style of Sweden coach and former U.S. coach Pia Sundhage, and had other nasty words for the Swedes. At 35 years old, it’s unclear whether Solo will be the U.S. goalie in the next major competition. Either way, Friday’s loss might result in some major changes with the USWNT.